As the only landscape architect with a retail nursery on this Houzz list, Best of Houzz & Angie's List Super-service award winner Classic Nursery & Landscape Co. has offered landscape design/build & outdoor construction services for over 35 years. With our 10 acre nursery and team of professional horticulturalists, talented construction crews & professional designers, we offer complimentary on-site meetings and estimates. Our unique & innovative approach provides affordable, detailed residential landscape architectural planning, easy flexibility in material choices, quick on-budget estimates and the unique opportunity to 'see the plants before you start'. 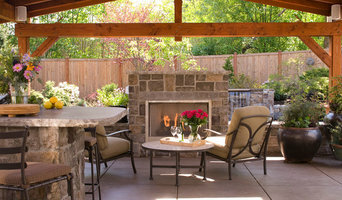 Find out how to set a budget, "20 questions to ask your landscape designer", see our special overstock pavers and flagstone (exclusive for landscape clients) and much, much more - at classicnursery.com! Classic's owner, Alan Burke is a graduate of the University of South Florida as well as the University of Florida. He has a background as a practicing landscape architect in Los Angeles and Seattle. Pacific Magazine, The LA Times Magazine, NW Home+Garden and American Home have featured his design work. A residential garden plan that he prepared is displayed on the back cover of the first edition of The Sunset Western Landscaping Book. Ed Hume has profiled Alan on his show Gardening in America and Alan has been featured by Evening newsmagazine, on City TV in Toronto, a CBS television special and The ABC Home Show. At the NW Flower & Garden Show, Classic's design received the Founder's cup as "Best of Show" and Classic completed a number of Gold medal award-winning gardens, including "La Palabra Pintada" a collaboration with New York Times bestselling author/artist Nick Bantock (Griffin & Sabine). With over 35 years in business, Classic's is located on a 10 acre nursery in the winery district of Woodinville. Performing all aspects of outdoor construction as well as landscape care, consulting, retail garden sales and environmental education, Classic's projects have earned numerous Grand Awards and Awards of Distinction from the Washington Association of Landscape Professionals. Classic was presented with two King County Green Globe awards for efforts in habitat restoration and wildlife education. The garden center provides a colorful shopping environment and a natural alternative for homeowners seeking advice regarding horticultural problems. Adobe Landscaping Co. provides quality, artisan design and construction. We collaborate with clients to build spaces reflective of who they are and how they want to access and interact with their outdoor environment. Here at Adobe Landscaping Co., we understand that you’re in need of outdoor rooms - spaces where you can stretch out and enjoy the beauty that we’re all surrounded with. Spaces where you can temper that urban side and perhaps sit around a fire with friends late into the summer evening. Adobe Landscaping provides fine, high quality fence design and construction. We specialize in cedar, non-traditional and metallic modern fencing. We work side-by-side with each client to design and plan the right fence for each unique space. We also specialize in designing and building decks customized to your needs and vision. We collaborate with you to build spaces that have a modern, yet simple style. We use custom joinery, such as mortise and tenon, to adhere structures with even, elegant lines, in order to maximize an artistic gestalt of design and function. Adobe Landscaping offers a wide variety of concrete services. We pour walls, pavers, driveways, and even planters. We provide natural stonework in the form of retaining walls and rockeries as well. We’re excited to look toward modern themes and highly skilled finishes. We work with the industry’s best finishers and can provide a wide array of finished product. Please call us for a free consultation and estimate! Shinda is the owner of Olympic Rockeries & Const. And has been providing service for well over 20 years in the Greater Seattle, Eastside, and Surrounding Areas. He started out by working side by side with his father as a young boy. Gaining a creative knowledge first-hand, he was inspired to open his own business, which he successfully did in 2004. 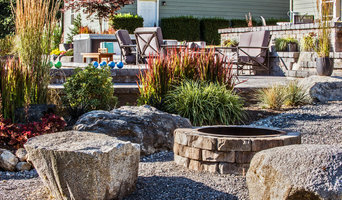 Today, Olympic Rockeries' goal is to provide exceptional results, whether it is a rockery, retaining wall, excavation, hardscaping or any other service we provide. Our focus is mainly geared towards the residential market and we love working with homeowners! Along the way we will ensure incomparable service to satisfy customers' needs. Our dependability and professionalism that we conduct throughout our work day to day, keeps our customers coming back. Give us a call, email, or a simple text and you won't be disappointed! We take pride in giving our customers the highest quality in workmanship, products, customer service. We are highly rated with the BBB with a A+ rating and Super Service Award winner with Angies List. Also, featured as a BEST CONTRACTOR by Angies List Magazine in 2012. BEST OF HOUZZ 2015-2017 in Customer Service! 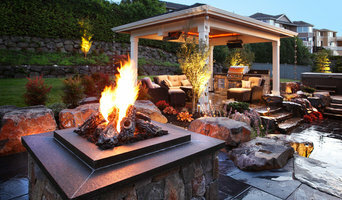 Gardenworkz Designs is committed to creating the outdoor space you have always dreamed about. I will create that perfect garden space, whether it's an active outdoor play area for a young family with children or a quiet retreat for yourself, or a combination of both. I am a landscape architect specializing in residential garden design for any construction budget. I work closely with my clients to realize their vision for the landscape, giving each project a highly personal touch, with a goal to achieve a sustainable and pragmatic result. Brooks Kolb LLC Landscape Architecture is a Seattle, Washington firm with a specialty in residential garden design for all budgets. Owner and principal Brooks Kolb, a Seattle native, offers a complete range of services tailored to residential clients, including but not limited to site master planning, cost analysis for budgeting and phasing, construction documents, City permitting, contractor selection and construction observation. If there is one thing I focus on to ensure a project’s success, it is communication. It’s always communication. That’s primarily how I differentiate myself from some highly qualified competitors. My overall mission is to help each client transform their property into highly usable and enjoyable outdoor spaces. The first step is to create a conceptual master plan for the site, obtain client feedback, and then revise and refine it until it meets their goals. The second step is to estimate probable landscape costs to help clients set their budgets, and then revise the design once more to meet that budget. Thirdly, we proceed to construction drawings and then I bid my projects competitively, using highly qualified landscape contractors with whom I’ve worked successfully and repeatedly. Lastly, I always perform construction observation site visits to make sure the project successfully realizes the initial design vision. The Sculpted Earth LLC is a landscape design and installation company serving the greater Seattle area. The Sculpted Earth was founded in 2010 to offer residential and commercial customers creative, artistic and ecologically responsible landscape solutions. Our mission is to create outdoor spaces that are livable, inviting, and creative. The Sculpted Earth can help you transform your yard into something truly special--a peaceful sanctuary, an extended family living space, a place to create the garden of your dreams, or whatever your personal vision may be. We complement client ideas with fresh and innovative approaches to design. Our outdoor spaces reflect a building’s architecture, express the owners personal style, and function as an extension of the home itself. The Sculpted Earth provides professional and exceptional service, whether it’s designing a small space or installing an expansive outdoor retreat. Best of Houzz 2019 Winner! We were previously a division of the beloved City People's Garden Store, and with the blessing of the former owners, the employees have organized into The Peoples Gardening Collective. We are continuing the legacy of the last 28 years of sustainable gardening. It’s been no secret that we only use organic products, that we discourage toxic pesticides and herbicides, and that we encourage proper cultural care of your garden through regular maintenance. In addition, we have taken a leap forward in Earth-friendly business practices, specifically, reducing waste by implementing a digital, paperless system. We are a team of landscape specialists with diverse degrees and educational backgrounds including horticulture, environmental sciences, arboriculture and forestry. This range of talent enables us to unlock the full potential of your exterior environment through careful water and soil management, and plant care grounded in legitimate science. Whether you already love your garden and wish to simply maintain it, or want to make improvements such as adding native plants, edibles or a rain garden, we are excited to help! In addition to our team we’ve also re-engineered our design-build model by drawing on our local community of talented small business owners, artists, and tradespeople. We can coordinate with our own trusted network of companies in fields such as carpentry, irrigation, electrical and masonry. We can bring the best and brightest Seattle has to offer. We hope you’ll join us in a holistic approach to beautifying your living space as well as preserving the integrity of our environment, communities and humanity. This is embodied in creating a collective by our employees, for our employees, and preserving the history of City People's which began as a workers cooperative. Our dedicated staff and long-standing history of work in the community coupled with our environmental ethic make us ahead of the curve; come with us. Premium Landscape Development and Excavation Services The region’s top Architects, Contractors, and Designers include us on their team to deliver quality and efficiency that matches the values that their customers expect. Our goal is to make every experience with our customer, one they could only rave about. With over 17 years of hands on construction experience Terrain has been creating luxury landscapes to the most exacting standards. As artisans in our trade we bring fine architecture to the outdoors. We have assembled a team of craftsmen who excel in building and installing timeless work. Terrain specializes in providing Excavation services for sites where attention to detail matters. Our excavation is centered around projects that require a high level of operator expertise, difficult to access areas and work that needs to done in a surgical like fashion. Neat and clean is just one of the values that our excavation teams bring to the jobsite. We are a full landscape construction & maintenance company serving Pierce County, South King County and Thurston County. With Nu-Life landscapes, you will receive great customer service from the start of your project to the finish. We will take you from a consultation, design, install & Maintenance with our consistent communication to ensure that the project is meeting our customers desires. Nu-Life Landscapes year round maintenance program is a great option for your property after it has been installed is a great way to ensure proper growth, water & nutrients to the landscape for the first year. 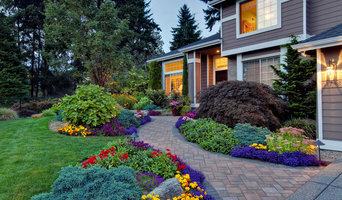 Green Spaces Landscaping is a Seattle landscape company that offers custom residential landscaping services throughout the greater Puget Sound Area. Our award-winning design and build firm has been serving customers for over 15 years, establishing a distinctive reputation as a dedicated landscape design-build firm in the area. Green Spaces is proudly owned by Ryan Sarvis who is a 3rd generation green industry professional. His passion and hands on shows in his designs and high level of customer satisfaction. This approach encourages employees to take pride in their work. Our landscape design team is unique in that each architect also serves as the project manager, acting as a single point of contact for the client and ensuring the highest quality service. Our close attention to detail and strong support system results in the development of extraordinary residential properties and stunning outdoor structures that will add beauty to the yard and home. What does a Newcastle landscape contractor do? Landscaping contractors execute lawn, garden and hardscaping plans that have been drawn up by an architect or designer. They may also provide design services on their own. After the everything has been installed, landscape companies can make adjustments, maintain plantings, take care of weeds and pests, and perform other tasks to keep the scheme looking its best. A licensed Washington landscaper should have detailed knowledge of Newcastle, WA weather and climate trends and conditions, and can choose plants and materials that are well suited to the area. 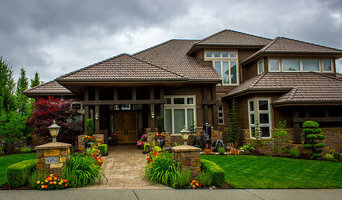 Residential landscape companies in Newcastle, WA also handle many of the same general duties as builders, including arranging for construction permits, hiring subcontractors and making sure that designs comply with Washington building codes. Find Newcastle landscaping services on Houzz. Narrow your search in the Professionals section of the website to Newcastle, WA landscape contractors. You may also look through photos of Washington landscapes to find one you like, then contact the landscaping company in Newcastle, WA who worked on it.